Wall Street banks last fall told Uber that it could fetch a $120 billion valuation in its IPO. What we didn't realize that the time was just how important that specific figure was to Uber CEO Dara Khosrowshahi. 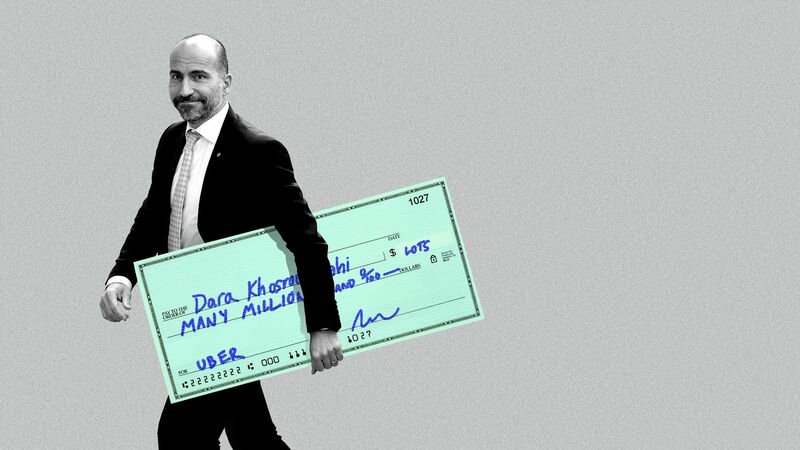 Khosrowshahi stands to make a boatload of money if Uber maintains an average fully-diluted valuation of at least $120 billion during a period of 90 consecutive trading days, according to a footnote in the company's IPO registration document. Specifically, he'd be entitled to stock options to buy 1.75 million shares. The fair market value when those shares began vesting last May was $59 million, but would be substantially higher at a $120 billion valuation (yes, even fully-diluted). Just to give Khosrowshahi some heartburn, Lyft shares closed yesterday at $56.11. That's 22% below the IPO price and just 18.5% above the final private share price. • Reuters reports that U.S. online lenders "are scrutinizing loan quality, securing long-term financing and cutting costs, as executives prepare for what they fear could be the sector’s first economic downturn." The sector is faces pressures in China, where the P2P sub-sector has been put into limbo by a new licensure scheme. The FT says that Dianrong, which has raised over $550 million and was co-founded by a LendingClub co-founder, has responded by cutting 2,000 jobs and begun seeking another $100 million to "weather the clampdown." • On the docket: H.I.G. Capital is being sued by translation services company TransPerfect Global, which claims the private equity firm improperly obtained confidential company data during a 2015 auction process and then used that information to benefit a TransPerfect that H.I.G. subsequently bought. 🎧 Pro Rata Podcast: Our new episode is a conversation with Bill Weld, the former Massachusetts governor who wants to be a spoiler in the Republican primary. We talk taxes, tech and Trump. Listen here. AT&T (NYSE: T) sold its 9.5% stake in Hulu back to the streaming joint venture for $1.43 billion. It had acquired the position via its purchase of Time Warner, with proceeds being used to pay down debt largely accumulated from that deal. Why it's the BFD: This lets Disney increase its stake in Hulu from 60% to 66%, just as it's planning to unveil its own Disney+ streaming service to compete with Netflix. Yes, AT&T continues to prep its own streaming service, because media companies are punishing us for deriding the cable bundle. Calendar: Netflix announces Q1 earnings after market close today. • Zoom Video, a San Jose, Calif.-based videoconferencing company, upped its IPO price range from $28-$32 to $33-$35. It still plans to offer 20.87 million shares, but now would have an initial of around $8.7 billion (were it to price in the middle). The company reports $7.6 million of net income on $331 million in revenue for 2018, and raised around $160 million in VC funding from firms like Emergence Capital Partners (12.5% pre-IPO stake) and Sequoia Capital (11.4%).